Fragrant coconut rice served with spicy paneer in a cream sauce. Widely served as lunch or dinner in Malaysia’s Sai Youth camps, centre or state-level Sai events. Add rice, coconut milk, salt, lemongrass, ginger, pandan leaves and water to the rice cooker. Once ready, loosen the rice with a fork. Meanwhile, heat some oil in a pan and fry the paneer cubes till they turn golden brown. Grind the tomato, garlic and shallots with a little water to make a paste. Heat oil in a pan and sauté the ginger paste. Add the tomato paste and chilli paste into the pan and continue to sauté till fragrant. Add salt and sugar to taste and cook for 2 minutes. Add in the paneer cubes and pour the fresh cream. Mix thoroughly to complete the paneer Sambhal. 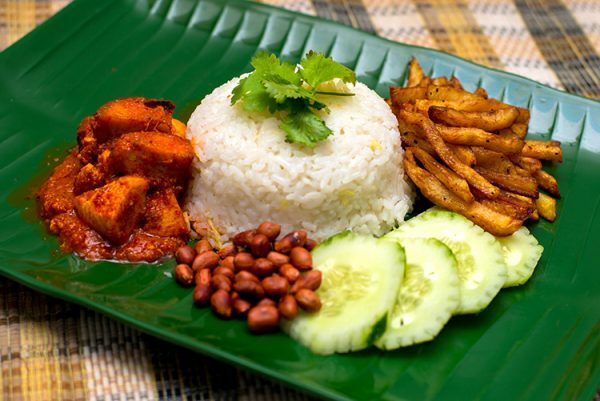 Place the Nasi Lemak rice on a banana leaf with the paneer sambal and garnish with sliced cucumber and dry roasted peanuts. Serve with a side of potato fries.